There is a small, little-known public space in New Barnet that was once a private garden, where James Pulham and Son went in 1871 to construct a . .
. . for a Mr T Higgs. [i] Later, in 1906, the Diary of Fred Rickett tells us that he also worked there on a ‘Rock and Water Garden’ for a Mr Braithwaite. Not much is left of this now, but tucked away in a distant corner of the gardens from the entrance, there is definite evidence of the onetime presence of a Pulham ‘rock builder’. 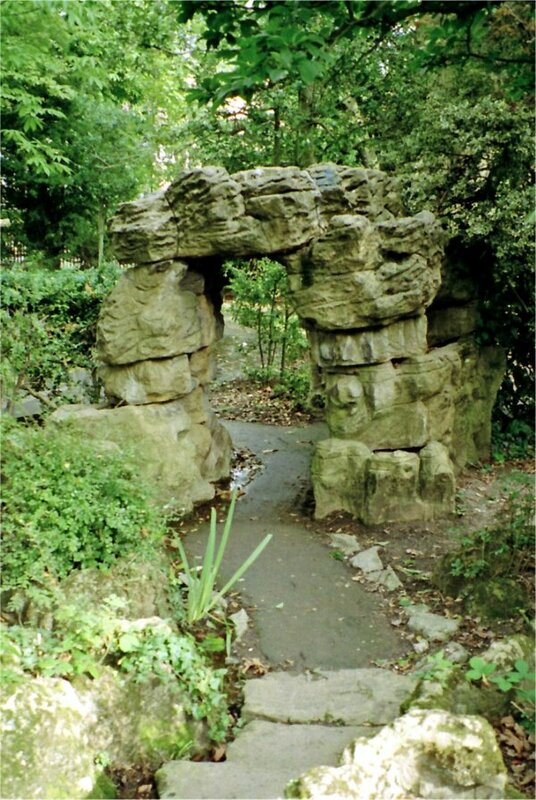 As you can see from Fig 1, it is a charming little rocky path and archway. Posted on February 27, 2014 June 4, 2016 by Claude HitchingPosted in Sites Month 2Tagged . . James Pulham and Son, fred rickett, Highland Gardens, New Barnet.